Plastic Shoe Covers protect floors even when your shoes are wet. These blue booties are great for protecting floors from scuffs, heel marks, dirt, and foot traffic. The light-weight designed Plastic Shoe Cover is great for applications like open houses or job biding. 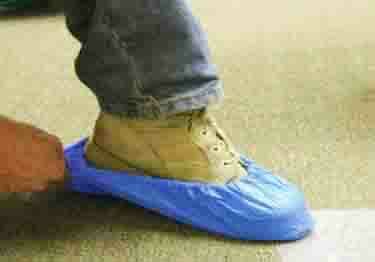 Plastic Shoe Covers are available in blue and stretch to fit up to a size 15 work boot. Unlike cloth shoe covers, Plastic Shoe Covers hold water from wet shoes or boots inside so floors don't get wet. These slip resistant booties are available in either 3 mil light-weight or 9 mil heavy-duty design. The 9 mil heavy-duty Plastic Shoe Cover is designed for all day use or as a reusable bootie. Are the plastic disposable shoe covers good for use on wood floors or just carpet? Plastic Shoe Covers protect floors even when your shoes are wet. These blue booties are great for protecting floors from scuffs, heel marks, dirt, and foot traffic. The light-weight designed Plastic Shoe Cover is great for applications like open houses or job biding. Great product. However, I do have some big feet people in my family (lol). So, they just have to remove their shoes. Will be making more purchases. As long as you sell em we�ll continue buying em! I was ordering another product from the same site when I came across these shoe covers. I've often thought it would be handy to have them, so I added it to my order. I haven't had a need to use them yet, but am pleased to have them on hand. The disposable shoe covers are a good value for the cost. VERY GOOD PRODUCT. ONLY COMPLAINT CARE FULL NOT TO TEAR WHEN PUTTING ON. Value is the ratio of quality to price. Very reasonable price. For guests tromping in out of the snow, these work very well. For workmen with heavy duty, vibram soles--not so much. The soles tear or quickly wear through the shoe cover. I give the product 3 1/2 stars. When pulling these on or off, you must be careful not to push your finger through the cover; very thin. Highly durable, UV-treated. Stays for up to 6 months protecting surfaces from scratches & abrasions; removes cleanly & easily. Protect any carpet with ultra-tough polyethylene that grips the surface to keep all dirt and contaminates out. Finished Floor Reusable Protection Film protects floors, counters, or any finished surface. Stays in place without tape. Surface protection sticky mats are tacky mats that pull light dirt or dust off shoes as the mat is stepped on.